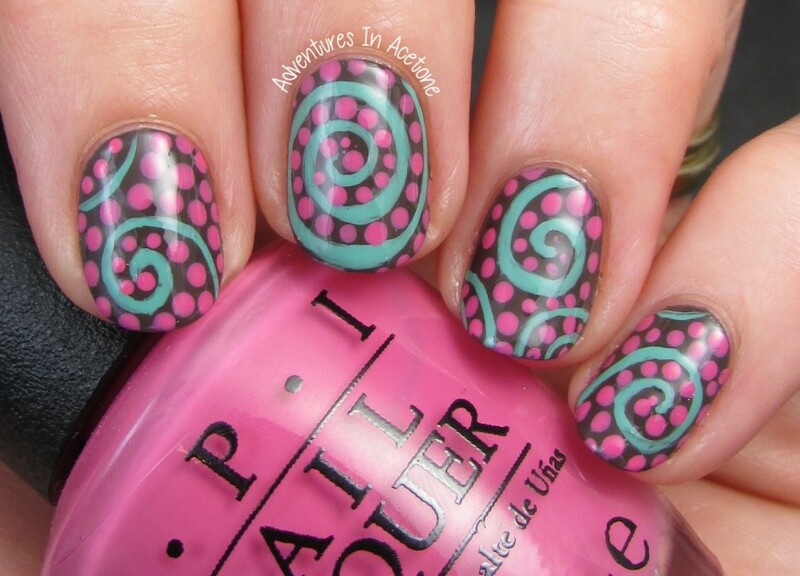 Swirl Nail Art With OPI Nordic Collection! Good morning, readers! I have another nail art look using the new OPI Nordic Collection polishes to show you today! It’s actually the mani I’m currently wearing and I love it so much! There are 12 polishes in the new OPI Nordic Collection, so the nail art possibilities are endless! I’ve used three shades for today’s nail art: How Great Is Your Dane?, Suzi Has A Swede Tooth, and My Dogsled Is A Hybrid. I started out with two coats of OPI How Great Is Your Dane? Then, using a thin nail art brush, I did random swirls with OPI My Dogsled Is A Hybrid. Finally, it was looking a bit blah, so I went back in with a small dotting tool and OPI Suzi Has A Swede Tooth and dotting all around the swirls. I liked this look much more than just the swirls, and it reminded me a bit of the fabulous Ursula Swirl nails that Chalboard Nails wore this week! Seche Vite was the top coat. What do you think? I am really enjoying coming up with nail art using the OPI Nordic Collection and I’m sure there is more to come! Thanks so much for reading! Nordic Collection nail lacquer shades each feature OPI’s exclusive ProWide™ Brush for the ultimate in application. Nordic Collection by OPI will be available in both nail lacquer and GelColor formulas beginning August 6, 2014. Nail lacquers will retail for $9.50 ($11.50 CAN) each at Professional Salons, including Beauty Brands, beautybrands.com, Beauty First, Chatters, Dillard’s, jcp Salons, Pure Beauty, Regis, Trade Secret, ULTA and ulta.com. GelColor is an in-salon, professional service only. Prices depend on the salon and range from $28 – $38 for a manicure and $35 – $45 for a pedicure. This mani is fabulous! Your artwork is amazing! Great design and beautiful color combination! I love love love these! SO fabulous! The colors are perfect! It's beautiful, I love the blue colour the best, so pretty! These are amazing! They remind me of the decorations on chocolates! This is so creative! Love the color combo too! you know how much i loved this – epic! WOW! This is the most beautiful design i've seen on a mani in a while. The colors go so well the colors go so well together.